Almost every photographer's dream is for their works to be published, whether on a book, magazine, or newspaper. As an amateur travel photographer, I am not exempted, I also want my works to be published, especially on a travel magazine. 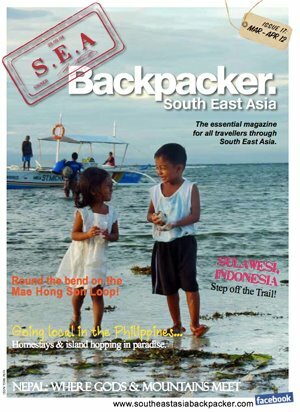 One of my favorite travel magazines is South East Asia Backpacker magazine. It’s a magazine for backpackers in South East Asia which is published once every two months. My first encounter with that magazine was when I saw it in a shelf in one of the guesthouses in Siem Reap, Cambodia. After reading a few articles, I can’t get enough of it. I wanted to bring it home. Fortunately, the guesthouse caretaker gave it to me. He said it was also left there by a backpacker. Through that magazine, I was able to stumble on their website and Facebook page, and later found out that backpackers can actually contribute to that magazine. I grabbed the opportunity and submitted photos for the magazine. Since the editorial team, led by Nikki Scott, their editor-in-chief, visited the Philippines in January, to introduce the magazine there and explore more about the country, I submitted photos of the Philippines, knowing that they will write articles about the Philippines. Good thing I went on a vacation to the Philippines last December so I have tons of Philippine photos. I submitted photos of Manila, particularly those historical, touristy places like Intramuros, Luneta Park, and Fort Santiago. On March 8, 2012, I received a letter from the Editor-in-Chief, Nikki Scott, stating that they just released the latest issue and one of my photos was published. Praise the Lord! It was another published photo. (after Expat Travel and Lifestyle) I really love SEA magazine and to be able to contribute to that magazine is a nice feeling. Grab copies of South East Asia Backpacker magazine now. Available in guesthouses, hostels, selected travel agencies, coffee shops, and diving shops across South East Asia. You can read the magazine here. My photo is on page 15. Salamat pre. Submit ka articles mo sa SEA Backpacker pre. May email add sila sa website nila. Tirahin mo. Yong whale shark experience mo maganda yon.